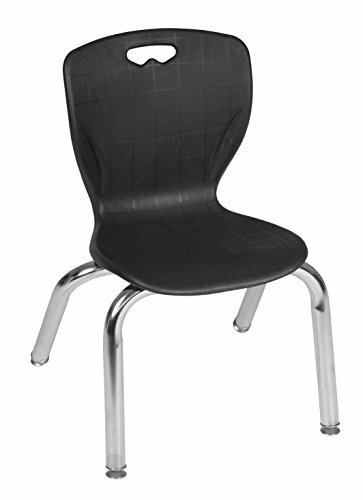 The stylish and durable Andy stack chair is ideal for classrooms, breakrooms and more. With three different sizes to choose from, the Andy chairs can accommodate students from preschool age up to adults, making it a great choice for schools or libraries who want a uniform look throughout all areas. It is constructed of a flexible and durable polypropylene seat and back and a chrome-colored tubular steel frame. Matching glides on the bottom of the legs allow for a sturdy- wobble free chair. A built in handle on the back allows for easy mobility. Store these great stack chairs away in space saving stacks of 12. The Andy chair ships assembled and is ready to use immediately. All Regency chairs are backed by a 5-year limited manufacturer's warranty on chair bases and frames and a 2-year limited manufacturer's warranty on chair mechanisms and upholstery.